A little more than two years after version 4.4 was released into the wild (on 21 January 2007), the Xfce development team has announced the availability of the new version of the Xfce desktop environment yesterday (yes I’m late to the party…). In an email, release manager Stephan Arts announced the new version 4.6 (only even numbers are used for stable releases), which has already been picked up in various articles all over the web’s darkest corners. 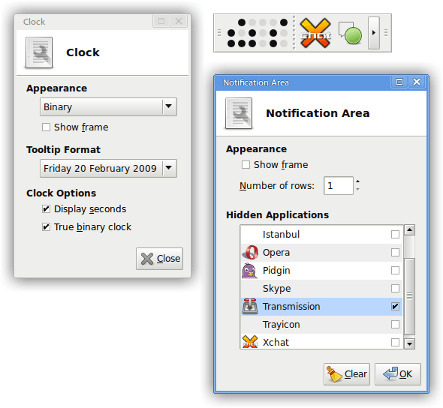 Xfce is an integral part of Xubuntu. 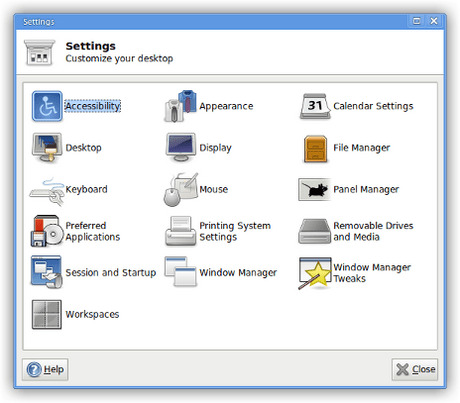 In its role as the desktop environment it provides vital applications such as the panels, the desktop, the file manager and the window manager (i.e. the thing that paints the borders around your windows and handles how they are placed in your screen), among others. In fact, it is the primary reason for Xubuntu’s existence – when Jani Monoses founded the project he did so because he wanted to combine the features of Xfce with the advantages Ubuntu brings. Due to technical problems, I haven’t been able to run Xfce 4.6 on my personal computer as of yet (something which I hope to change in the coming week), so I’m going to base myself on the excellent Xfce tour prepared by Xfce developer and previous Xubuntu developer Jérôme Guelfucci and my experiences while running Xubuntu from my USB drive. I’ll also be using the screenshots provided by Xfce developer and Xubuntu-Xfce Liaison Jannis Pohlmann because I’m lazy. First of all, Xfce’s panel (xfce4-panel) has received some love with lots of bugs fixed that especially the proud owners of multiple monitors won’t mind to miss. It also comes with updated panel plugins. This adds nifty new features to e.g. the system tray, which now allows you to hide certain icons. This is quite useful to hide, for example, that NetworkManager icon that always sits there yet is almost never needed after your network has been set up. 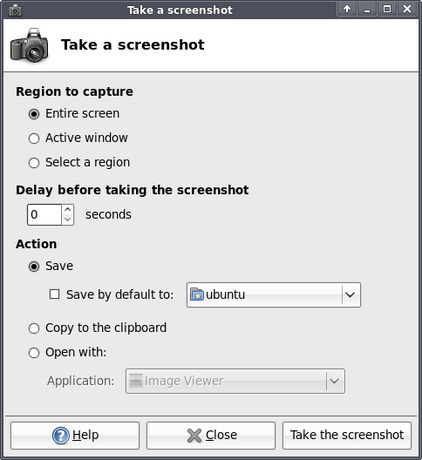 Although not part of the release, the screenshot plugin has been developed into its own application by Jérôme Guelfucci (and David Collins added some nice new features, too) and is now named Xfce4 Screenshooter. 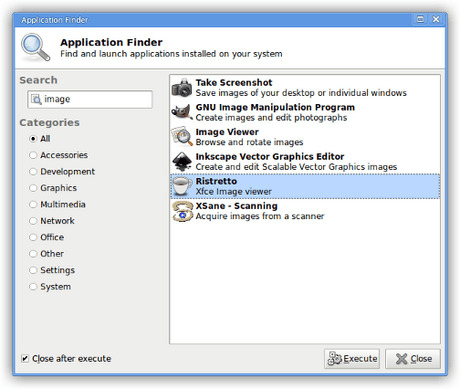 It, among other features, allows you to capture a region of the screen or a single application. Now the keyboard shortcut for PrtScn can be set by default :). The desktop manager, xfdesktop, now includes an oft-requested feature: rubber banding, or the ability to click and drag to select multiple icons to manipulate. Furthermore, the Xfce menu is now a submenu of the context menu when you have icons on your desktop – something that some people have expressed dissatisfaction about. On the xfce4-mixer front, Jannis Pohlmann has rewritten it to sport a more polished interface, and to use Gstreamer. Some refer to this as bloat, but it really makes for a more maintainable application that supports multiple sound systems more easily, is better tested and will work on the systems of more people (although it will undoubtly not work on the systems of some others, namely those who can’t get Gstreamer to work). With the new mixer also comes a panel plugin that allows you to change the volume with a mere scroll over the panel icon, which is very useful unless you don’t have a scroll wheel. The session manager has also received some love. 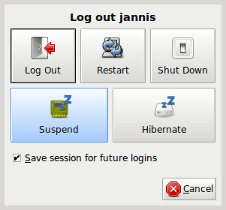 Based on code in Xubuntu, originally written by Jani Monoses, but almost entirely rewritten, Xfce now supports suspending and hibernation by default. Though the Suspend and Hibernate buttons might attract a bit too much attention with their size, considering how often they’ll be used, it’s a useful addition nonetheless. A feature that will help out a lot of users and will save me a lot providing support, is its ability to automatically restart important applications if they just so happen to crash. The reason this is so useful is because the panel has a habit of occasionally crashing seemingly without reason, with people left not knowing what to do. Of course, the Xfce Window Manager, xfwm4, was also updated, mainly thanks to the work of the Xfce project founder Olivier Fourdan, from France. It can now see when an application is busy and won’t respond, and offer you to force it to quit. It also offers a useful new “Fill” option that allows you to resize a window to use as much space as possible that is left unused by other windows. This can come in handy when working with applications such as the Gimp. Besides these improvements there are some other tweaks and stability and performance improvements. Xfce’s file manager that Benedikt Meurer developed for Xfce 4.4, Thunar, has received attention from Nick Schermer and Jannis Pohlmann. Being one of Xfce’s show-off applications, it just got a little better with many bug fixes and performance improvements coming in. It also ships a new plugin to set an image as your wallpaper from within Thunar, and now follows the XDG user directories specification, which basically means that it provides you with folders for Music, Videos, Pictures, etc. and translates their names if you use another language. Furthermore, connected drives that have not been mounted (i.e. prepared for reading by the computer) will be distinguishable by their translucent icons. Encrypted devices are now supported as well. As for Xubuntu, word has it that we may get folder sharing in 9.04, which many people have been clamouring for. Jannis Pohlmann and Jasper Huijsmans have been working on a rewrite of the AppFinder. It now has a cleaner interface and updates in real-time, as always allowing you to easily find installed applications and, by dragging them to the Launcher-creation interface, easily create panel shortcuts. The Xfce menu has also been updated to really comply with the freedesktop.org standard (perhaps you noticed that the menu in previous versions was structured a bit oddly). Unfortunately, no menu editor is included and, with menu merging not being supported yet, using an alternative menu editor like Alacarte won’t work either. It’s manually editing the files or making do with the menu as-is, for now. And last but certainly not least, one of the biggest new features: xfconf. Admitted, you won’t (shouldn’t) notice much of this, but it’s quite the improvement. Basically, it provides a new, central configuration system for Xfce similar to, but simpler than, GNOME’s gconf. It does offer some nifty new useful applications though. 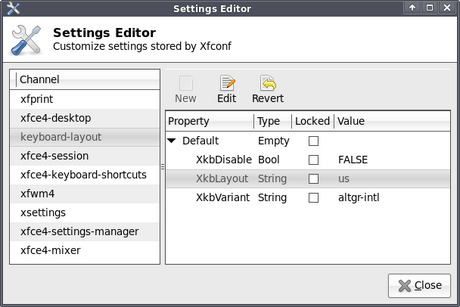 For example, there’s now one central place to edit the settings of all applications that use xfconf – the Settings Editor (xfce4-settings-editor). It also includes a command-line tool, and it is this that looks extremely valuable to me. Not because I like to type commands, but because you can bind them to keyboard shortcuts. Yep – editing preferences with a simple key combination. xfconf-query -c keyboard-layout -p /Default/XkbLayout -s "us" && xfconf-query -c keyboard-layout -p /Default/XkbVariant -s "altgr-intl"
xfconf-query -c keyboard-layout -p /Default/XkbLayout -s "us" && xfconf-query -c keyboard-layout -p /Default/XkbVariant -s "intl"
Now all you need to do is bind them to a keyboard shortcut and you’ll be set! Of course, this is some pretty advanced stuff, but it’s there when you need it and hardly noticeable when you don’t. Plus, it might make for a good blog post in the future, so if you have any more useful applications of this, do tell me :). With the new settings backend comes a new Settings Manager which allows you to edit many of the settings in one window and is more neatly organised and better suited to small monitors in general. Furthermore, a lot of the settings windows have been redesigned and options have been added – I’ll kindly refer you to the excellent tour for an overview. 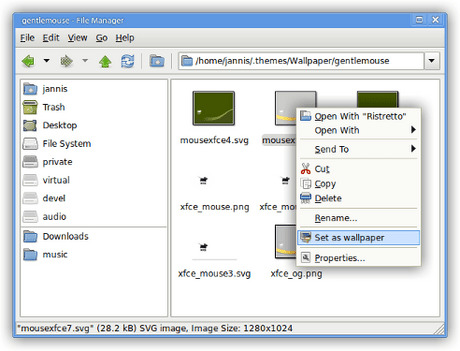 You can download Xfce in source code form or using the oft-praised graphical installers. Packages for several distributions will without doubt already be available. However, the easiest and recommended way is to wait for your distribution to provide the packages. Xubuntu 9.04 will have Xfce 4.6.0 and already has Release Candidate 1. If we’re lucky, version 4.6.1 will even make it in time which will contain the first important bugfixes and translation updates. If you’re running Xubuntu 8.04 “Hardy Heron” or 8.10 “Intrepid Ibex”, then you’re lucky, because Jérôme Guelfucci has prepared packages with help of the Debian Xfce group and Lionel Le Folgoc. The Xfce development team is already looking forward to version 4.8. The plan is to do a shorter release cycle this time, with one (probably optimistic) guess targeting a new release in about a year. Some excellent features have already been developed to be included in 4.8, such as my pet peeve drag ‘n drop support for panel icons (no more messing with commands in launchers! ), menu merging so you can actually use a menu editor, and several improvements to Thunar. All in all, this has shaped up to be a very nice release with some excellent new features, some of them nowhere to be found in other desktop environments, which demonstrates once again why I like Xfce for more than performance alone. With some of the improvements for 4.8 already checked in and many more waiting in line, I’m already excited. I’ve fallen far short when it comes to attributions, failing to name Xfce’s excellent translation team, the people behind the Xfce distros, the various communites, Brian Tarricone, Mike Massonnet, -I guess I should stop naming people because I’m bound to forget many more, or even people of whom I don’t even know they’ve contributed. Yeah, Xfce rocks! I especially love the low mem footprint. Nevertheless these Xfce 4.6 improvements were partially already integrated in my Xubuntu 8.04 (HH). For example the session manager buttons were already quite nice. The screenshot applet is good to know. I use it every day. 🙂 The problem with the whole menue editing is indeed a bit annoying. I built my own solution by manually editing the menue and .desktop files. It’s beutiful but time consumptive. Finally I hope that the Xfce-Settings-menue will be expanded a bit. When comparing other distros or OSes there’s often much more to configure. I’m an Ubuntu user, but after trying XUbuntu in a 256MB virtual machine (in a Mac), I must say I’m very inclined to adopt Xfce as my next desktop. BTW, how the memory footprint have evolved since the previous version? I do not if it is my imagination…but xfce4.6 goes faster than than the last xfce and looks better. Beautiful work Xfce developers. I am using it on Xubuntu 9.04 right now. The GUI polish is very nice. I especially like the ability to hide system tray icons, that was a nice touch. Blends perfectly with Ubuntu. I like it so much I am putting Xubuntu 9.04 on my laptop. I appreciate everyone’s hard work and time put into this project. I don’t know too much about running an OS in a Virtual Machine, but how does Processor Speed figure in to the equation? I have Xubuntu 8.?? installed on my old Dell 3500 that I gave to my Sister-in-Law. I upgraded the RAM to 256 and replaced the 6 GB HDD with 60 GB. But the processor is a 333MHz Celeron and it runs pretty slow. To be fair, it doesn’t really run any slower that when it ran Win98. Just curious. Have been using XFCE4 desktop from the beginning of my Ubuntu experience, which was started with 6.10. Version 4.6 has some good improvements, but even according to xfce.org THERE IS NO DOCUMENTATION for 4.6 (sorry for caps, but I tried to make a point here!). So some bigger changes like all xfconf environment and new menu system is without documentation! How these things should be used, when there is no documentation??? Obviously there is no other way than to wait up to 4.8? You can always search the internet to see if anybody has written anything about whatever you want to do, and often an interface speaks for itself. However, it is indeed unfortunate that nobody has written documentation, and at the moment Jim Campbell and Jannis Pohlmann are working hard to fix this for the next version. If there’s anything specific you would like to know, you could mention that on the Request a Post page, and I could see if I could write something about it. Also note that the menu system still isn’t finished (4.6 is kind of a transitional period for that, which, too, is unfortunate – documentation on how to manually edit it is available on the Xfce wiki). I love XFCE, and a new version is very much appreciated. If it gets faster, I’ll love it even more.